Star Nollywood Actress Battles P'square.Award winning artists Psquare and Nollywood actress Steph Nora Okereke are currently at logger heads, a development that might see them heading to the courts.Steph-Nora Okere recently alleged that they stole materials from Jeje, one of the tracks in her yet-to-be released debut album. Incidentally, the 14-tracker album titled 'The Invasion' released by the twin-brothers on their Square Records (SR) has a song entitled Jeje, and featured RnB/Soul crooner, Waje. She explains further: “I sent the song over to Jude via email and he listened to it. The next day I called him for his opinion and he said exactly these words ‘Stephnora the song is good but don’t release it like that because it doesn’t meet the standard of the Nigerian market’. I asked him what should be done and he suggested that I return to the studios and brush it up. Ope Banwo in his reaction disclosed that he intended to file a copyright infringement lawsuit against P Square next week if they do not respond to their demand letter. “This kind of thing should not be tolerated. 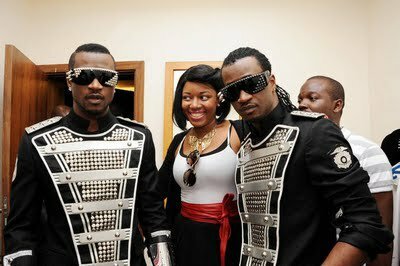 P Square is a big group that should not take advantage of up and coming artistes and their friends. Stephnora trusted them and they stabbed her in the back,” he added. Jude Okoye was contacted on phone,he denied stealing or tampering with Steph-Nora’s song. He however, challenged the actress to go to court if she feels otherwise, adding that she was only seizing the occasion to attract more attention to her acting career.